When I first started working for Lulu Carpenter’s in Santa Cruz, I was pouring every coffee to order on a Chemex, Aeropress, or frenchpress. Every now and again, someone would ask, “where’s the Clover? How’s it doing?” Was Clover a dog? Was it sick? I didn’t realize it was a brewing system. We got it back from “the vet” about a month later and I was awe struck; automated, exceptionally high quality coffee with a renowned name and reputation. People traveled, literally, many many miles to visit our shop because they had heard of this amazing device. Why? I thought. A little history. From what I understand, the Clover was invented by some Stanford Engineers who were committed to making a high quality system. Eventually, the company got their product out to specialty shops and some time later, they sold the Clover to Starbux. Shame for us, great for them. 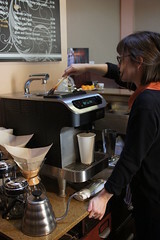 Our particular machine was the first Clover in California and has been serving our little shop well ever since. It is, essentially, a mechanized siphon. 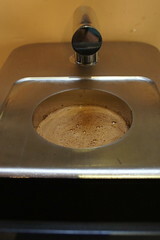 Coffee is brewed for a specified time and temperature, water is precisely dosed into the top chamber, and the finished coffee is sucked through a finely engineered microfilter to produce a coffee that does not have a much (if any) grit, left over grounds, or oils. What you get, essentially, is “tea coffee.” For me, that is the easiest way to describe the light yet auromatic and delightfully flavorful coffees that are brewed by the Clover. This is my daily schpeal. If you want something that is muddy and heavy, go for french press, though I believe you lose most of the subtlties of the beans. The Chemex offers a very strong, flavorful cup of coffee that essentuates the flavors of the brewed beans and magnifies their intensity. The Clover is special, you get a very light coffee that maintains the subtitles and unique notes of the beans, does not sacrifice smoothness for strong flavors, brewed on a very consistent apparatus. Sure, it is not for everyone. The way we do it, in terms of coffee measurement and the particular beans in use, will differ drastically from other shops. There are some coffees we carry that I would not really recommend for the Clover, but are others that I zealously implore people to try. A few people are not happy with the “tea-ness” of the coffee. But most people are overwhelmingly impressed with the quality. I, however, am not the biggest fan of the clover in terms of flavor. It is good, but it will always be the eternal A- cup because there are just better brewing methods out there. While it works well for some coffees, I generally find that the flavor is far too light and a little drab for serious coffee drinkers. However, it is something worth trying atleast once. Here is my favorite part about the machine; its simplicity. Everything is automated save the small stir of the grounds and placing of the cup under the spout (I do not want to admit how many times I have forgotten to put a cup out on a busy day, hearing the coffee pour down the drain is the most defeating sounds of my barista existence). After that, you can let the machine do it’s thing. About a minute later, you get your coffee. The interface is super straight forward and allows a lot of flexibility for individuals to change the temperature and brew times. It is fast, easy, simple, and makes a great cup of coffee. The only small drawback is that after sustained high volume use, the microfilter can get clogged and needs a thorough cleaning. 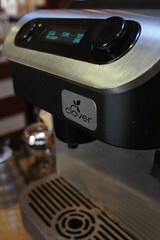 The most striking feature of the Clover machine is the company image and name itself. 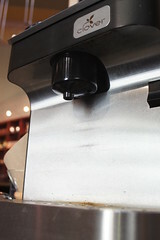 A lot of coffee snobs and noobs alike come in and exclaim, “woooow, you have a Clover? !” Yes, yes we do. And yes, it is awesome. There is almost this cult following among visiting baristas, a subttle ackowledgement that our store has a Clover and is thus “legit.” I won’t go into how this is changing now that SB introduced the machine’s into their shops (though I have not heard the best reviews from customers). I will just say, it works well for us. Honestly, I am still a normal siphon and Chemex guy. I like being a craftsman and “playing” with my coffee and they generally just taste better. 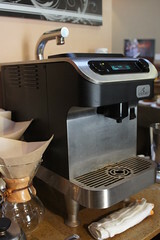 Other methods of brewing are more interactive and the automation of the Clover kind of took that away from me. But, I cannot deny what a time saver and dependable work-horse it has been. Oh, and the Clover does have one fun feature; the finished “puck” of coffee that comes up out of the body at the end like the idol on the pedastal in Raiders is always fun to scrape off into the tray.